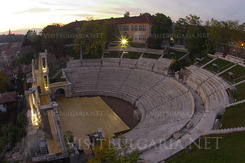 Tourism season in Plovdiv started with festive manifestation, Bulgaria. The festival will started with ritual Thracian dances performed by folklore ensemble “Thracia” in front of the Tourism information center in Plovdiv. Participants can enjoy new exposition in Cultural center “Trakart” - “The Antique window”. Festive program also include performances of theater “Hend” and “The academy folklore choir.